The Rattler Football team led early in its home finale Saturday afternoon, only to lose late as visiting Howard Bison overtook FAMU for a 37-26 Mid-Eastern Athletic Conference victory at Bragg Memorial Stadium. 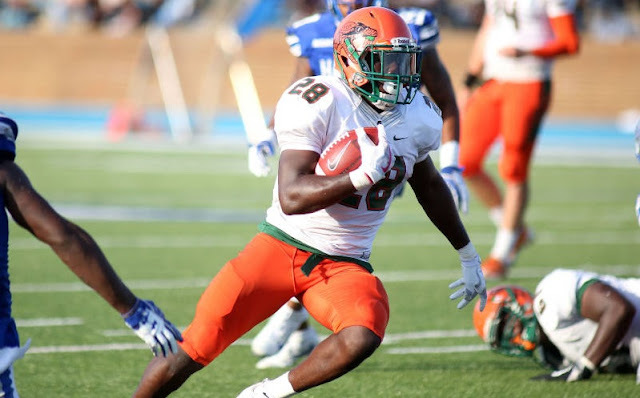 The bright spots for Famu (3-7, 2-5 in MEAC) included redshirt freshman halfback Ricky Henrilus, who rushed for 153 yards on 20 carries and one score, a two-Yard blast which put FAMU ahead, 7-0 with 12:45 in the opening quarter. After Howard (6-3, 5-1 in MEAC) tied the game on a Newton 24-yard TD toss to Kyle Anthony, FAMU quarterback Ryan Stanley answered late in the first with a 25-yard aerial to Kareem Smith for a 13-7 lead with 3:43 left. Stanley would finish the day 20 of 29 passing for 217 yards and to score to Smith, while rushing for another in the second period. Yahia Aly’s 24-yard field goal pushed the Rattlers ahead to 16-7, before Howard’s Anthony Philyaw pounded in on a three-yard run to cut the FAMU edge to 16-13, after a failed two point try. Stanley’s three-yard keeper moved the needle to 23-13 for the Rattlers with 4:59 left in the half, but Newton’s last gasp Hail Mary made it a three-point game at the break. Senior Brandon Norwood led the Rattlers receivers with six receptions for 60 yards in his final home game while junior linebacker Jabreel Hartly led the defense with 11 total tackles, 1.5 for nine yards in losses. How to get the correct price for the dumpster you wish to rent?